A result of the protracted economic crisis has been an unprecedented increase in the tension of the political situation in the capitalist countries, both within those countries and in their mutual relations. The intensified struggle for foreign markets, the abolition of the last vestiges of free trade, the prohibitive tariffs, the trade war, the foreign currency war, dumping, and many other analogous measures which demonstrate extreme nationalism in economic policy have strained to the utmost the relations among the various countries, have created the basis for military conflicts, and have put war on the order of the day as a means for a new redivision of the world and of spheres of influence in favour of the stronger states. 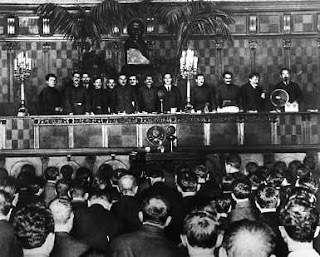 Japan's war against China, the occupation of Manchuria, Japan's withdrawal from the League of Nations, and her advance in North China, have made the situation still more tense. The intensified struggle for the Pacific and the growth of naval armaments in Japan, the United States, Britain and France are results of this increased tension. Germany's withdrawal from the League of Nations and the spectre of revanchism have further added to the tension and have given a fresh impetus to the growth of armaments in Europe. It is not surprising that bourgeois pacifism is now dragging out a miserable existence, and that idle talk of disarmament is giving way to "business-like" talk about armament and rearmament. Once again, as in 1914, the parties of bellicose imperialism, the parties of war and revanchism are coming to the foreground. Quite clearly things are heading for a new war. The internal situation of the capitalist countries, in view of the operation of these same factors, is becoming still more tense. Four years of industrial crisis have exhausted the working class and reduced it to despair. Four years of agricultural crisis have utterly ruined the poorer strata of the peasantry, not only in the principal capitalist countries, but also—and particularly—in the dependent and colonial countries. It is a fact that, notwithstanding all kinds of statistical trickery designed to minimise unemployment, the number of unemployed, according to the official figures of bourgeois institutions, reaches 3,000,000 in Britain, 5,000,000 in Germany and 10,000,000 in the United States, not to mention the other European countries. Add to this the more than ten million partially unemployed; add the vast masses of ruined peasants — and you will get an approximate picture of the poverty and despair of the labouring masses. The masses of the people have not yet reached the stage when they are ready to storm capitalism; but the idea of storming it is maturing in the minds of the masses — of that there can hardly be any doubt. This is eloquently testified to by such facts as, say, the Spanish revolution which overthrew the fascist regime, and the expansion of the Soviet districts in China, which the united counter-revolution of the Chinese and foreign bourgeoisie is unable to stop. This, indeed, explains why the ruling classes in the capitalist countries are so zealously destroying or nullifying the last vestiges of parliamentarism and bourgeois democracy which might be used by the working class in its struggle against the oppressors, why they are driving the Communist Parties underground and resorting to openly terrorist methods of maintaining their dictatorship. Chauvinism and preparation of war as the main elements of foreign policy; repression of the working class and terrorism in the sphere of home policy as a necessary means for strengthening the rear of future war fronts — that is what is now particularly engaging the minds of contemporary imperialist politicians. It is not surprising that fascism has now become the most fashionable commodity among war-mongering bourgeois politicians. I am referring not only to fascism in general, but, primarily, to fascism of the German type, which is wrongly called national-socialism—wrongly because the most searching examination will fail to reveal even an atom of socialism in it. In this connection the victory of fascism in Germany must be regarded not only as a symptom of the weakness of the working class and a result of the betrayals of the working class by Social-Democracy, which paved the way for fascism; it must also be regarded as a sign of the weakness of the bourgeoisie, a sign that the bourgeoisie is no longer able to rule by the old methods of parliamentarism and bourgeois democracy, and, as a consequence, is compelled in its home policy to resort to terrorist methods of rule—as a sign that it is no longer able to find a way out of the present situation on the basis of a peaceful foreign policy, and, as a consequence, is compelled to resort to a policy of war. Such is the situation. As you see, things are heading towards a new imperialist war as a way out of the present situation. Of course, there are no grounds for assuming that war can provide a real way out. On the contrary, it is bound to confuse the situation still more. More than that, it is sure to unleash revolution and jeopardise the very existence of capitalism in a number of countries, as happened in the course of the first imperialist war. And if, in spite of the experience of the first imperialist war, the bourgeois politicians clutch at war as a drowning man clutches at a straw, that shows that they have got into a hopeless muddle, have landed in an impasse, and are ready to rush headlong into the abyss. It is worth while, therefore, briefly to examine the plans for the organisation of war which are now being hatched in the circles of bourgeois politicians. Some think that war should be organised against one of the great powers. They think of inflicting a crushing defeat upon that power and of improving their affairs at its expense. Let us assume that they organise such a war. What may be the result of that? As is well known, during the first imperialist war it was also intended to destroy one of the great powers, viz., Germany, and to profit at its expense. But what was the upshot of this? They did not destroy Germany; but they sowed in Germany such a hatred of the victors, and created such a rich soil for revenge, that even to this day they have not been able to clear up the revolting mess they made, and will not, perhaps, be able to do so for some time. On the other hand, the result they obtained was the smashing of capitalism in Russia, the victory of the proletarian revolution in Russia, and— of course—the Soviet Union. What guarantee is there that a second imperialist war will produce "better" results for them than the first? Would it not be more correct to assume that the opposite will be the case? Others think that war should be organised against a country that is weak in the military sense, but represents an extensive market—for example, against China, which, it is claimed, cannot even be described as a state in the strict sense of the word, but is merely "unorganised territory" which needs to be seized by strong states. They evidently want to divide it up completely and improve their affairs at its expense. Let us assume that they organise such a war. What may be the result of that? It is well known that at the beginning of the nineteenth century Italy and Germany were regarded in the same light as China is today, i.e., they were considered "unorganised territories" and not states, and they were subjugated. But what was the result of that? As is well known, it resulted in wars for independence waged by Germany and Italy, and the union of these countries into independent states. It resulted in increased hatred for the oppressors in the hearts of the peoples of these countries, the effects of which have not been removed to this day and will not, perhaps, be removed for some time. The question arises: What guarantee is there that the same thing will not result from a war of the imperialists against China? Still others think that war should be organised by a "superior race," say, the German "race," against an "inferior race," primarily against the Slavs; that only such a war can provide a way out of the situation, for it is the mission of the "superior race" to render the "inferior race" fruitful and to rule over it. Let us assume that this queer theory, which is as far removed from science as the sky from the earth, let us assume that this queer theory is put into practice. What may be the result of that? It is well known that ancient Rome looked upon the ancestors of the present-day Germans and French in the same way as the representatives of the "superior race" now look upon the Slav races. It is well known that ancient Rome treated them as an "inferior race," as "barbarians," destined to live in eternal subordination to the "superior race," to "great Rome", and, between ourselves be it said, ancient Rome had some grounds for this, which cannot be said of the representatives of the "superior race" of today. (Thunderous applause.) But what was the upshot of this? The upshot was that the non-Romans, i.e., all the "barbarians," united against the common enemy and brought Rome down with a crash. The question arises: What guarantee is there that the claims of the representatives of the "superior race" of today will not lead to the same lamentable results? What guarantee is there that the fascist literary politicians in Berlin will be more fortunate than the old and experienced conquerors in Rome? Would it not be more correct to assume that the opposite will be the case? Finally, there are others who think that war should be organised against the U.S.S.R. Their plan is to defeat the U.S.S.R., divide up its territory, and profit at its expense. It would be a mistake to believe that it is only certain military circles in Japan who think in this way. We know that similar plans are being hatched in the circles of the political leaders of certain states in Europe. Let us assume that these gentlemen pass from words to deeds. What may be the result of that? There has already been one such war against the U.S.S.R., if you remember, 15 years ago. As is well known, the universally esteemed Churchill clothed that war in a poetic formula—"the campaign of fourteen states." You remember, of course, that that war rallied all the working people of our country into one united camp of self-sacrificing warriors, who with their lives defended their workers' and peasants' motherland against the foreign foe. You know how it ended. It ended in the ejection of the invaders from our country and the formation of revolutionary Councils of Action3 in Europe. It can hardly be doubted that a second war against the U.S.S.R. will lead to the complete defeat of the aggressors, to revolution in a number of countries in Europe and in Asia, and to the destruction of the bourgeois-landlord governments in those countries. Such are the war plans of the perplexed bourgeois politicians. But while the bourgeoisie chooses the path of war, the working class in the capitalist countries, brought to despair by four years of crisis and unemployment, is beginning to take the path of revolution. This means that a revolutionary crisis is maturing and will continue to mature. And the more the bourgeoisie becomes entangled in its war schemes, the more frequently it resorts to terrorist methods of fighting against the working class and the labouring peasantry, the more rapidly will the revolutionary crisis develop. Some comrades think that, once there is a revolutionary crisis, the bourgeoisie is bound to get into a hopeless position, that its end is therefore a foregone conclusion, that the victory of the revolution is thus assured, and that all they have to do is to wait for the fall of the bourgeoisie and to draw up victorious resolutions. That is a profound mistake. The victory of the revolution never comes of itself. It must be prepared for and won. And only a strong proletarian revolutionary party can prepare for and win victory. Moments occur when the situation is revolutionary, when the rule of the bourgeoisie is shaken to its very foundations, and yet the victory of the revolution does not come, because there is no revolutionary party of the proletariat with sufficient strength and prestige to lead the masses and to take power. It would be unwise to believe that such "cases" cannot occur. "We have now come to the question of the revolutionary crisis as the basis of our revolutionary action. And here we must first of all note two widespread errors. On the one hand, the bourgeois economists depict this crisis as mere ‘unrest,' as the English so elegantly express it. On the other hand, revolutionaries sometimes try to prove that the crisis is absolutely hopeless. That is a mistake. There is no such thing as an absolutely hopeless situation. The bourgeoisie behaves like an arrogant plunderer who has lost his head; it commits folly after folly, making the situation more acute and hastening its own doom. All this is true. But it cannot be ‘proved' that there is absolutely no chance of its gulling some minority of the exploited with some kind of minor concessions, or of suppressing some movement or uprising of some section or another of the oppressed and exploited. To try to ‘prove' beforehand that a situation is ‘absolutely' hopeless would be sheer pedantry, or juggling with concepts and catchwords. In this and similar questions the only real ‘proof' is practice. The bourgeois system all over the world is experiencing a most profound revolutionary crisis. 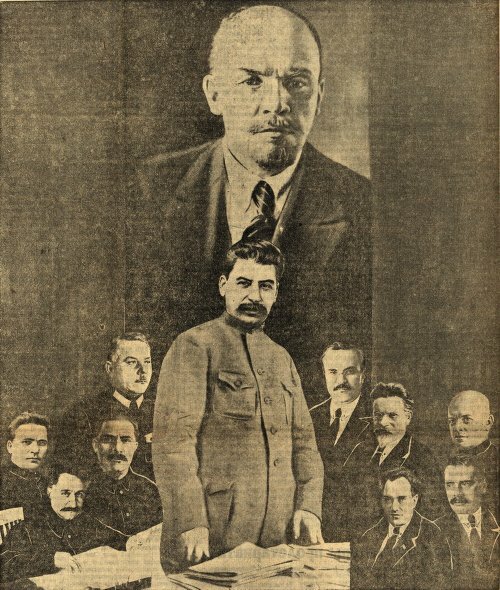 The revolutionary parties must now ‘prove' by their practical actions that they are sufficiently intelligent and organised, are sufficiently in contact with the exploited masses, are sufficiently determined and skilful, to utilise this crisis for a successful and victorious revolution" (Lenin, Vol. XXV, pp. 340-41 .